This is my favorite chocolate dessert of all time, possibly because it is like a giant slice of chocolate truffle heaven. You don’t taste the chestnuts at all, but they give it an extraordinary richness, and it truly is like eating a giant slice of light truffle. It is ridiculously easy. I made this one morning, and left the house with an entire cake intact. By the time I got back, the Smalls has attacked and there was less than a quarter left! With thanks to High Fearnley-Whitingstall for his gorgeous recipe, which has only been changed very, very slightly. Reprinted with permission from GOOD TASTE, NAL Books, 2016. By Jane Green. Photo credit: Tom McGovern. 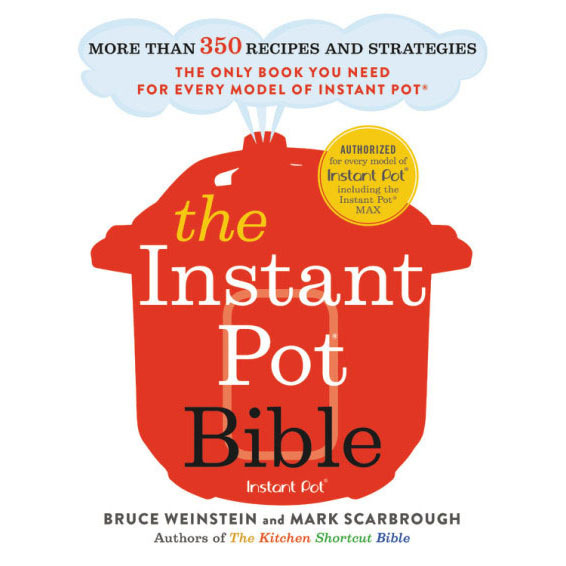 ON-DEMAND: Listen to Faith and Jane discuss this recipe—and others for the holidays. 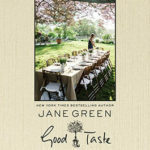 And read our review to learn more about Jane’s new book. Grease and line and 9” springform cake tin. Melt the chocolate and butter together in a pan over a very gentle heat. In another pan, heat the chestnuts with the milk until just boiling, then mash thoroughly with a potato masher (or process to a rough purée in a machine). Put the egg yolks in a bowl and mix with the sugar. Stir in the chocolate mixture, vanilla extract and chestnut purée until you have a smooth, blended batter. Whisk the egg whites until stiff and fold them carefully into the batter. Transfer the mixture to the greased, lined tin and bake for 25-30 minutes, or until the cake is just set, but still has a slight wobble. If you want to serve the cake warm, leave to cool a little, then release the tin and slice carefully – it will be very soft and moussey. Or leave to cool, when it will have set firm. It’s good to serve it with a trickle of double cream, especially when warm, but it is also delicious unadulterated. 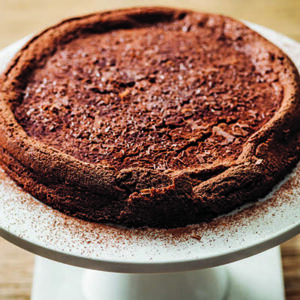 Would you freeze this delicious looking torte? If not, how long would it keep unfrozen? I.e. Could I bake it 3-5 days in advance of use, or should I rather freeze it? Hey Caryl. Good question. I checked with Jane and I wasn’t at all surprised by her answer: She’s never tried. Can you imagine why? The house smells like chocolate heaven when this is in the oven. When it comes out, it needs to cool slightly, but then. . .watch out. 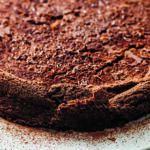 This torte disappears before it can be completely cooled, wrapped, and frozen! Therefore, it’s never been tried. And, just as a side note, it’s my thinking that cookbook authors and recipe developers are so careful, so exacting when creating their recipes. They’ll make one recipe 100 times to account for variables. If something can be made days or weeks ahead and be just as good (or even better), there’s usually a mention of that in the recipe because it means it’s been specifically tested that way. If you’re feeling adventurous and make this ahead, DO circle back and let us know how it goes. what if I want to use fresh chestnuts. Do they have to be roasted or will they cook in the cream and be fine? I want to make this recipe soon so I can make it for holiday company. If it is a success then I want to be able to make it for the holiday party as well. Please let me know asap if you can. Love, love this show and I hope it will be carried on by others when you have to leave Faith which I hope is none too soon!!! The recipe looked fabulous and smelled heavenly when baking. Unfortunately, the timing was off. I took it out after 30 minutes while still wobbly. Two hours later, it pulled away from the pan properly but it is still quite raw in the middle. I am putting it back in again hoping I can save it. Has this happened to anyone else? Oh no. I’m bummed for you. Perhaps it has to do with the way ovens vary wildly in their temperatures. I hope you were able to save it. During the show, Jane did say that the torte is really quite moussey. I used a teflon spring form pan and lowered my temp by 25 degrees, which I do with teflon and glassware. I have a gas oven that tends to be on the hot side. My cake took about 35 minutes and did have a lot of wobble but I took it out b/c the edges were becoming quite set. I might have been able to bake it another 5, but after an hour on a cold back porch it set up rather nice. Very light and fluffy. Glad to hear it worked out well. Thanks for listening! Yes this happened to me too. The flavor was fine but we did not like the moussey softness so I put it back in the oven and baked it until a toothpick came out mostly clean. Second attempt I added more chestnuts (to increase starch) and baked for 45 minutes which was about 5 minutes too long. This yielded a much firmer torte. Whatever your preference for texture, the dense chocolate flavor is wonderful. Wholeheartedly recommend this recipe. Delish. It was a hit at family dinner party. What do you mean by “Grease and Line” springform pan? Prepare the pan as you would any baking pan. Grease, meaning rub butter (or whatever fat you use) all over the pan. And line the bottom with parchment paper. There’s a good tip on kitchn how to cut a perfect parchment round for your pan. Is it possible to use another liquid instead of half & half to stew the chestnuts to accomodate lactose intolerance? Maybe coconut milk or almond milk? Both coconut milk and almond milk will change the flavor and the torte will be considerably less mousse-y, is our guess. Just be aware of that. Made this for the second time since the show aired! Can’t wait to have it for dessert. My husband and I actually skipped dessert when we went out for dinner last night, knowing we’d want seconds of this tonight! So amazing, and so easy.